I met Carolyn in a shelter for flood victims at the First Baptist Church in Morehouse, Missouri. Although Morehouse isn’t directly on the Mississippi River, flood waters quickly rose when systems that normally drain into the Mississippi backed up. The situation was further complicated when a dyke created to keep nearby Highway 60 open for traffic diverted even more water into town. No one had much warning and most of the small town’s homes sustained water damage. I plan to tell you more about Morehouse in an upcoming post, but since I won’t be available to post again for several days, I want to introduce you to Carolyn. Carolyn welcomed me and brought a chair so I could sit beside her bed, one in a row against the wall. Although about 50 people were staying in the shelter at its peak, most have now moved in with family and friends. Only about a dozen remain. She was gentle, soft-spoken and friendly as she told me there had not been time to gather any of their belongings – only their two dogs. Carolyn has diabetes and neuropathy that prevents her from standing on her feet very long, so cannot work. Her husband works as a cart gatherer at WalMart. “We are very lucky,” she told me, “my husband only had to take two days off of work during all this. 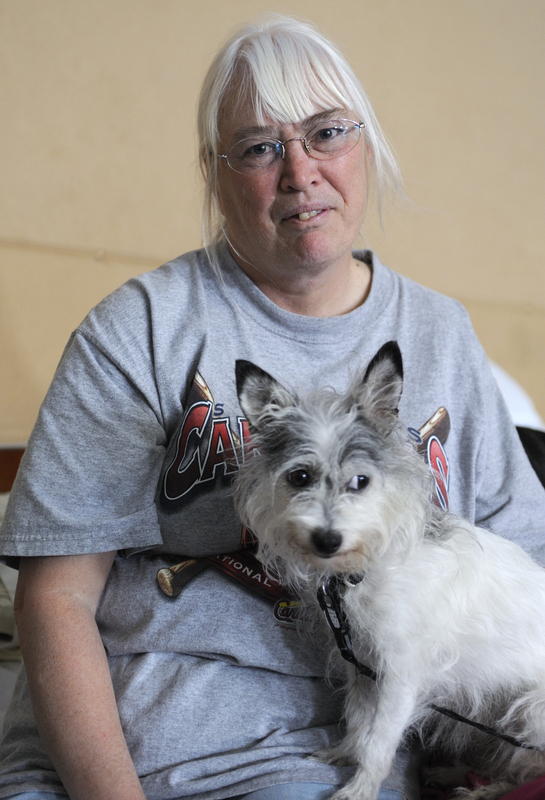 We won’t be able to live in our house anymore, but we have signed up for help from FEMA.” She introduced me to her dog, Sissybell, who she said is part “Shee-a-it-zu” “I don’t want to say it the other way because I don’t like to say that word,” she said with an embarrassed smile. Before I left home, I had lunch with my dear friend, Norma Jeanne, who is now in her 87th year. She’s a lively, joyful little pixie with an enormous, loving heart. Norma Jeanne lives on a fixed income and isn’t wealthy, but when I told her about my upcoming trip to the flooded area, she pulled out a $20 bill and asked me to give it to someone that needed it. As I sat with Carolyn, I knew this was the right person. I told her about Norma Jeanne, gave her the bill and asked her to remember my friend in her prayers. Carolyn was very touched and appreciative and repeated Norma Jeanne’s name to be certain of it. Sometimes it’s the “small” things that feel the biggest. This entry was posted in 2011 Mississippi River Flooding and tagged Mississippi River Flooding 2011. Bookmark the permalink. I do plan to revive the blog and give it attention and new energy then – so I hope you will check back in a few months! Regarding your comment about the video – I find it a little confusing. You posted your comment on “Carolyn – Faces of the 2011 Flood” and there is no video link there at all. There is one with the following post and as far as I can recall that is the only video link anywhere in my blog! Anyway, thanks again for your comments and I’ll get back at this as soon as I can!